Not being able to handle questions effectively after your presentation is something that seems to scare the bejesus out of even experienced speakers. It comes up very often in my public speaking training. I see it all the time. Speakers deliver an exciting speech. There’s thunderous applause and arms are waving in the air, owned by people with burning questions requiring helpful answers. Then fear grips the speakers in the question and answer period and they cannot handle questions effectively, if they manage to answer at all. 2. Stretching out an answer for so long that everyone forgets the question, including the speaker. This is usually in an attempt to reduce the number of questions that could be asked. Twisting a fairly straightforward question into something entirely different and answering that question. But that does not have to be your story. If you hang with me just a little longer, I will give you some easy strategies that will reduce your dread and help you handle questions effectively. If you follow them, I promise you will not fear another question, ever again. 5. Be sure to end the session on a positive note. Even though many speakers know well in advance that they should invite the audience to ask questions, they fail to prepare for this section. How can you handle questions effectively if you don’t prepare for them? Don't worry, there are several things you can do to prepare to handle questions effectively and save your speech. For difficult questions, I like to imagine an enemy in the back of the room shouting questions at me. I imagine they want to destroy my presentation so, I try to come up with questions that I would ask if I were in their place. You can also make your presentation to your friends or colleagues and ask them to come up with questions as if they were your real audience. The techniques I mention in #4 below are also helpful in this regard. Preparing for questions in this way, not only helps you to handle questions effectively, it also helps to reduce the degree of uncertainty and fear you feel around answering questions. It also builds your overall public speaking confidence, even before you speak. Sometimes because we’re afraid and just want this questioning thing to be over, we become defensive or even aggressive about certain questions. This is especially so, if we judge the questions to be malicious or hostile. 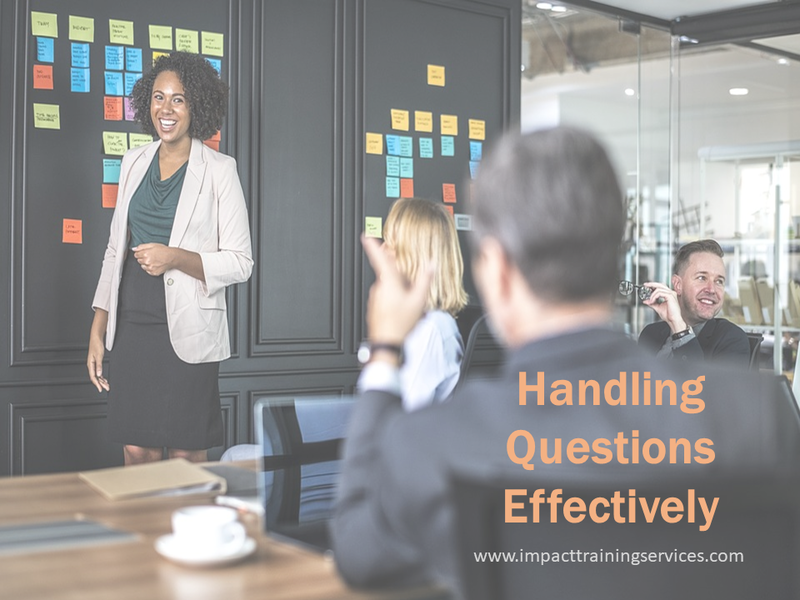 But this does not serve your purpose and again, not handling questions such as these effectively, can derail your otherwise well-prepared speech. Instead, be especially polite and have an attitude that communicates that you welcome questions and appreciate the opportunity to answer them. Remind yourself that there are no stupid questions and stick to the tips in #3 below as much as possible for every question. In this way you will handle questions effectively. Just between me and you, on your way home, in the car, with the windows rolled up and the doors locked…that’s may be the time for another attitude altogether! Remember that appearing defensive and or aggressive can send the message that you resent questions and you did not prepare yourself to answer them. A key requirement of managing the question section of your speech effectively is how you answer the actual questions. Here are some useful tips to help you with that. Clarify the question before you attempt to answer, repeating it in your own words, if necessary. If you don’t know the answer, admit it, promise to research it and get back to the questioner. Take their contact info and get back to them as promised. 2. Disarm loaded questions. They’re out there. Members of audiences whose sole purpose is to try to trip you up with a question based on false premises or baseless assumptions. Politely maintain your position. You may also ask the person to explain the question and share any facts they have on the matter. 3. Divert irrelevant questions. These questions come from persons whose motives are similar to those describes at #2 above. They are out-of-place and even if you know the answer, politely ask the person to explain how the question is relevant to the subject at hand. 4. Divide complex questions. These are the questions that may have three or more parts. Divide them up and answer each part individually. This demonstrates that you can answer questions effectively and also aids your audience’s understanding as well. 5. Don’t let a questioner give a speech. This maybe difficult to handle tactfully. If you interrupt the person, some members may accuse you of shutting down the person. If you don’t, you maybe accused of letting the person take over. Use your judgement but be firm and polite. 6. When asked a “do you agree” question...answer directly “yes” or “no” and then back up your answer with facts. Do not attempt any long rambling, evasive answer. Being able to answer the questions expertly establishes that you’re comfortable interacting with the audience and you have the skill to do it. It would also be a good idea to practice your questions and answers when you're practicing your speech. When you prepare to handle questions effectively, you should also prepare for the eventuality that questions might be slow in coming. In that case, you can prompt the audience by using the YMBT technique. This is when you introduce a question by saying “You may be thinking…” and then you share one of the audience’s main concerns. This usually have the effect of generating much discussion and questions from the audience. You can also pose and answer some questions you would have prepared just for this purpose. A good way to introduce such a question is by saying something like, “if I were in your place, I might ask me...”. There are several reasons why there may be no questions when you ask for them. Recognize this and prepare for this eventuality. I have seen this happen more times than I care to recall. A good speaker gives a great presentation. And then he allows himself to be caught up in a senseless, power play argument with a member of the audience. Then in vexation, he declares the session closed. Really?! If you want to know the effect of this, listen to the conversations after the speech. All people talk about is how rude and ignorant the speaker was towards the particular questioner. All because you did not answer her question effectively. A good way to end the session is to signal that you’re bringing the session to an end. Inform the audience that you’re taking only one or two more questions. It is important to make this announcement with enough time to answer any subsequent questions properly. Take these questions from persons who have not spoken before and if possible, take one from a male and one from a female. Thank the audience for their questions. Mention briefly how their questions have helped you to improve their understanding of your point of view on the topic. Ending with a smile and a relaxed attitude just about nails it. I cannot emphasize enough that if you don’t end the questions and answers session on a positive note, you run the risk of undoing all the great work you did with the entire presentation. Answering questions effectively is an integral part of your presentation. It’s also an opportunity to connect more deeply with your audience. This increases your credibility and trust with the audience as well as their willingness to accept your ideas or buy your product and services. What I want you to do now, is to take these 5 strategies and study them, practice them and ask people you trust for feedback. I want you to really understand the importance of learning how to handle questions effectively after your presentation. You will reduce the levels of uncertainty and the degree of fear around public speaking in general. If you can do this, then I’m talking to the next BIG influencer...so how will you answer questions after your next presentation? How to introduce the speaker like a boss! ← How to Double Your Personal Productivity in 4 Easy Steps!